The new issue of Lonny magazine has arrived, so I thought it only fitting that my first Room to Runway post use one of its' beautiful interior images. 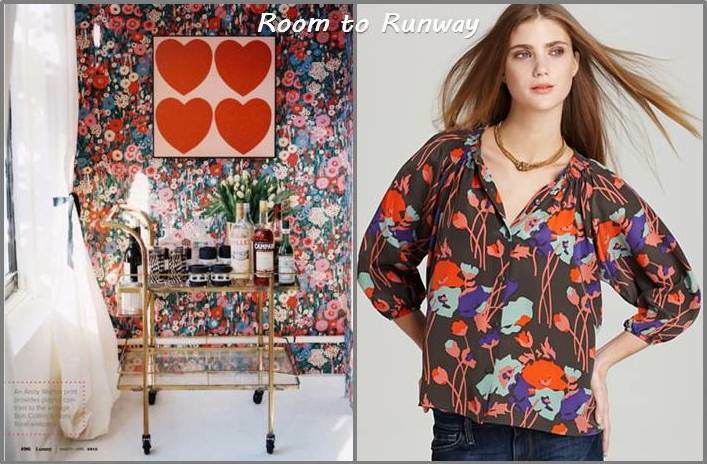 The geometric floral print of this Tucker blouse has a modern but feminine feeling just like the vintage Bob Collins & Sons wallpaper featured in the dining area of Kemble Interiors designer, Anna Burke's New York apartment. The gold chain necklace on the model mimics the sleek bar cart and provides an extra element of sophistication. To see the rest of the Anna's apartment visit here. Tucker blouses (which I'm crazy about and own 4 of) are available here and here. I love this post! You found the perfect top to pair with this Lonny image. Loving florals! If you want to wear the room, now you can! Haha, I love that wall paper! Definitely not your grandmother's floral. Love this post! Thanks for stopping by my site. nice! i'm loving florals for spring! Well done, girl! I'm obsessed with that wallpaper! I think I need the top too! great content and lovely posts, a must check out spots...followed.